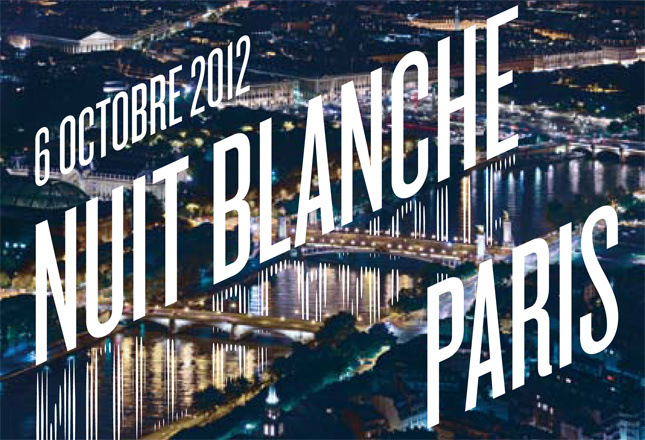 Confectionique: Nuit Blanche in Paris! The first time Adam and I ever experienced Nuit Blanche in Paris was in 2006 and it was completely by accident. We had no idea that Paris put on one grand "arts party" for all it's patriots and visitors to France. We just happened upon it (that year the theme was inspired by the work of Yves Klein). Nuit Blanche is an all-night party created 10 years ago as a grand cultural art experience for the masses. It is an opportunity to explore one of the major traditions that is Paris...art. During Nuit Blanche all the major museums are open free of charge to all who wish to wait in line to enter, and the metro runs way into the early morning hours to bring all the happy, weary patrons back home. It's a celebration of art and community. Adam and I made sure that our time in Paris this year would include Nuit Blanche. Although a soggy, rainy festival tonight, it didn't keep away those who love art: there were families, children in strollers, older couples, people of all languages...from many counties who came together for one soul purpose, to enjoy the arts as a community. The spirit of the Nuit Blanche festival is what inspired our little version of it each month at Confectionique. What better way to bring a community of people who create and those who enjoy these creations together than on the very evening we open our market for the month? We certainly didn't stay out tonight until the last metro, but the time we spent among our artistic comrades was quite fun! We hope you join us on Thursday, October 18 from 5-8PM for our own Nuit Blanche to kick off our "Midnight in (Spooky) Paris" market!